Molecular genetic analyses present powerful tools for elucidating demographic and biogeographic histories of taxa. Here we present genetic evidence showing a dynamic history for two cryptic lineages within Eudyptula, the world's smallest penguin. Specifically, we use a suite of genetic markers to reveal that two congeneric taxa ('Australia' and 'New Zealand') co-occur in southern New Zealand, with only low levels of hybridization. 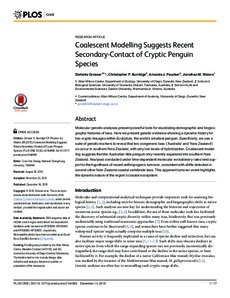 Coalescent modelling suggests that the Australian little penguin only recently expanded into southern New Zealand. Analyses conducted under time-dependent molecular evolutionary rates lend support to the hypothesis of recent anthropogenic turnover, consistent with shifts detected in several other New Zealand coastal vertebrate taxa. This apparent turnover event highlights the dynamic nature of the region’s coastal ecosystem.